Glowing purple like the night sky before dawn, Aura Thinking Putty's unique color is sure to catch the eye. White by day, it glows a mystical purple at night to help you tap into your creative potential. Darken the lights and enjoy Aura's violet hue foran hour or two. Designed for ages 8 and up, this putty is fun to play with, but also provides stress-relieving qualities while you play. Please note: Thinking Putty should be used by children ages 3 years and older; like all creative toys, Thinking Putty can get messy if left alone with young children and should not be used by children under three years of age for this reason and should always be used by older children with supervision. Thinking Putty is best left in its tin when not in use; it can stain. To remove if stuck on shirt/pants/sofa/rug/sheets, use rubbing alcohol from the drugstore over the stuck pieces (the greatest percent isopropyl alcohol is best in the rubbing alcohol). 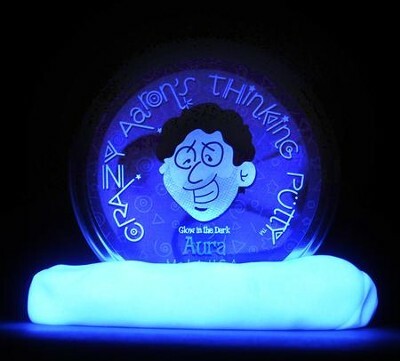 I'm the author/artist and I want to review Aura, Glow-In-the-Dark Thinking Putty.